A classic for modern holiday joy, this "White Christmas" masterpiece is elegant yet understated. 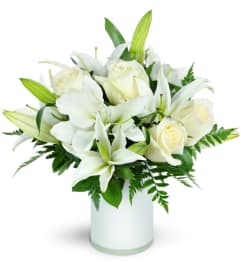 When average won't do, give this unforgettable winter floral gift, featuring designer-inspired white lilies, white carnations, lotus pods, and more in a uniquely stunning birch-covered container. 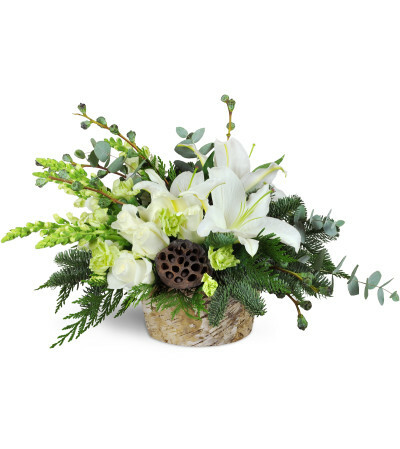 For a holiday party that will be the talk of the town, decorate with these sumptuous floral statement pieces. 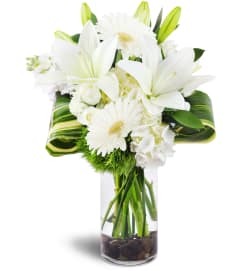 Flawless white lilies, white carnations, green mini carnations, snapdragons, lotus pods, eucalyptus, and pine are expertly arranged in a birch-covered dish container. Beautiful flowers and prompt delivery. Thank you! Service was awesome! Communicated with me to let me know that my last minute purchase would be without a particular flower but they replaced it with something as gorgeous. Sent photos to make sure I would approve and still delivered the same day. You all are awesome!!! The receiver loved the bouquet as well. Thank you!!!! 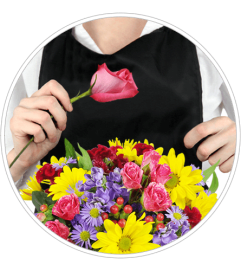 Rainbow Florist Designers is a Lovingly Florist in Santa Clarita. Buying local matters. Discover how Lovingly supports local florists. Copyrighted images herein are used with permission by Rainbow Florist Designers.